Smooth, comfortable seats with rounded corners sit on "Victorian" style bases at the ideal height for people of all sizes. 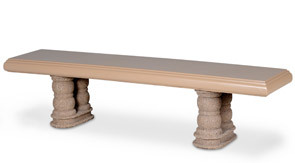 Built tough for convenient use both indoors and outdoors, this heavy-duty park bench is naturally vandal and theft resistant. 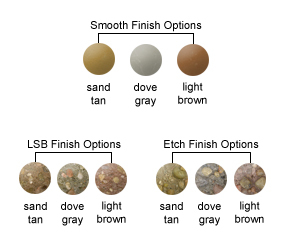 Bench seat is available in the Smooth finish color options while the bench legs are available in the Light Sand Blasted (LSB) and Exposed Aggregate (Etch) finish options as shown. Virtually maintenance free, the seat should be sealed with a water repellant sealer every couple years, and can be left outdoors all year long. No assembly required, bench ships in one piece.